Get Top Service from Our Experienced Team. With more than a decade of experience, Same-Day Rubbish Removal work hard to offer fast, ‘no fuss’ service at the lowest possible prices — saving you precious time and money! 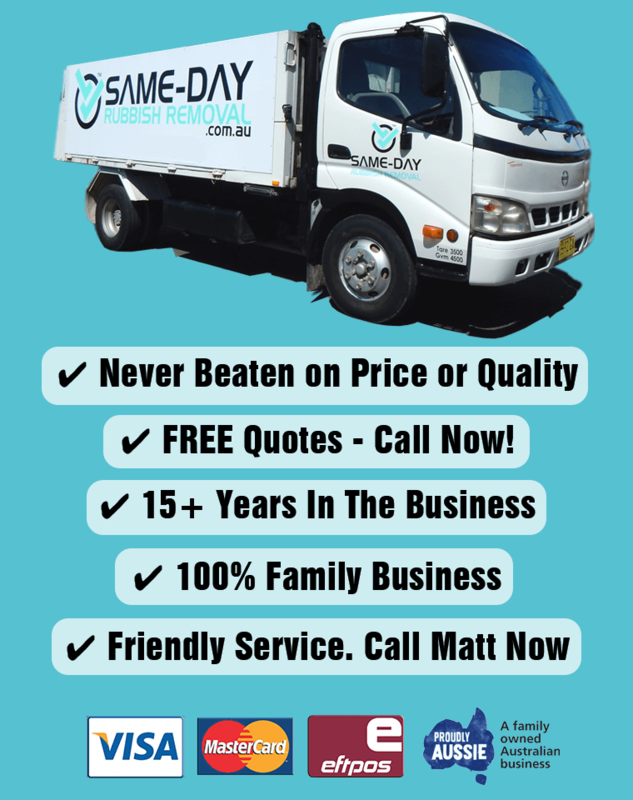 We service most Sydney areas, and getting a free quote is easy, just give us a call and we’ll be happy to help with your enquiry. Owner and founder, Matt, thinks that fast and reliable service shouldn’t break the bank — in fact, the service offered by Same-Day Rubbish Removal often works out substantially cheaper than hiring a skip bin, but without all the fuss and hard work! 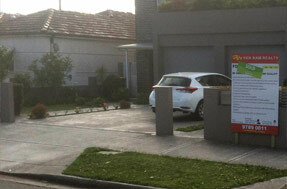 With Sydney’s population growing, and our customer base growing, Matt's team certainly keep busy. The reason we’re busy is because we’ve become well known for top service, that doesn’t cost you top dollar! In fact, we have an average 5 Star Review Rating on Google from our customers. What are you waiting for? That pile of junk isn’t going to walk itself to the tip. Help us, help you! We’ll do all the hard work, and have your place rubbish free in no time. Call us now for a free quote. Many people have told us that we should put our prices up so we can make more money with less work. We don’t like this idea because we believe everyone should be able to afford responsible rubbish removal. We’d rather make less profit than have people use other unethical junk removal alternatives. We do our best to make sure that as much of your waste is recycled as possible. Part of the reason we’re able to offer better all round service is due to the extensive experience our team has had in the industry, we know all the tricks of the trade and are able to offer the lowest possible price because of that. 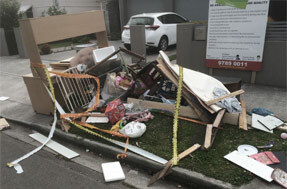 There’s never been a job too hard for our team either, so we’ll agree to just about any rubbish removal job. However, there have definitely been some very challenging ones, but these have only increased our experience and skill set to better complete every future job. We started out as a small family owned business, working across a few Sydney suburbs. We’ve now expanded our services to every corner of Sydney, so no matter where you are, we can come to you. Despite our huge growth over the years, we’re still family owned and offer the same great Aussie service. Even if your junk doesn’t fit into the list of common items above or you don’t live in the listed areas, we’d love to help solve your waste problem. Give our friendly team a call and we’d be happy to give you a no obligation, free quote - we know you won’t find a better deal. Call us now on 0402 737 046, we look forward to helping get your place looking as it should.